Eating Well Magazine has included Madison’s Dane County Farmer’s Market as one of their Top Farmer’s Markets in America. We say the Dane County Farmer’s Market is a “must” while visiting Madison. Join the throngs of Badger fans as they peruse the goods for the perfect last-minute additions to their tailgates, while locals stock up on pesticide and herbicide free produce, bright floral bouquets and fresh-baked breads. Create the perfect light pre-game breakfast by grazing on warm loaves of spicy cheese bread, old-fashioned apple cinnamon doughnuts, whoopie pies, artisan cheeses and ostrich jerky. The market is held year-round every Saturday (except the last Saturday of December) from 6am-2pm, rain or shine, on the Capitol Square from mid-April through mid-November. 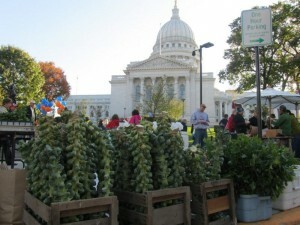 The remainder of the year, the market moves indoors of the Monona Terrace. See website for locations and times.